Standard halogen Down Lights look good... but have real problems. Most modern homes built within the past ten years will have some down lights, they can produce a lot of pleasant looking light that can enhance both living and office space. They look like the example here and most of them will have a matching power transformer to change 240V down to 12V. Each lamp is usually rated to 50 Watts of power, which can quickly add up to a full kilowatt of continuous power drain if say twenty are in operation around the home. Each iron type Lighting Transformer can consume an additional 20 Watts of power and reach 90º, which is an effect which is often not included in building power assessments. About one-quarter of the light produced goes the wrong way and just lights up the roof space. When operating, they generate a huge amount of heat. The temperature at the rear of a Halogen down light will typically reach 250º C.
These lamps only last 3000-5000 hours before they blow and need replacing. If they have been covered or partially-covered by insulation, lamp life is further reduced by the extra heat. Poorly ventilated Halogen lamps may only last 500 hours and exceed 300 degrees. Another forgotten risk is the buildup of dead insects on top of these light fittings. The bright light in the ceiling space attracts insects through gaps in roof tiles that are killed by the heat and slowly add up, covering the lamp. The image below shows a typical buildup of bugs after only one year of normal use. more pressing reason to upgrade than just the affects of high power consumption. LED lights only consume one-sixth of the energy as the Incandescent, Halogen lamps. Where a house or business has many down lights to replace with LED lamps, the change will make a big difference to power bills. Of course, this only makes sense if the LED lamps can be purchased for a reasonable price. Thanks to recent technical developments, both the quality and price of LED lamps have improved. 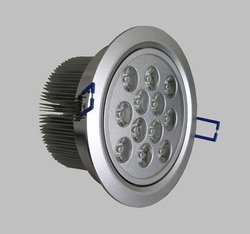 The lenses fitted to the LED devices are available in a wide selection of beam angles from 30º to 120º . The working life of these units are now very long. 50,000 to 70,000 hours is considered to be very normal. Be wary about many cheap LED lamps that pretend to be a quick plug-in replacement for a Halogen lamp. Many of these are made up of clusters of clear 5mm leds. The problem is that this shape does not permit much output because they cannot loose the small amount of heat necessary. These cheap LED clusters tend to be Cool White only, about half the brightness of a 50Watt Halogen lamp and generate a narrow spot of light only a few degrees wide. Outside of that spot, the light level is very poor. The operating life of this style of lamp is very short and they should be avoided. 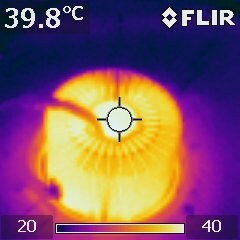 The Infrared image here is a 12 x 1 Watt lamp shown from inside a ceiling space after one hour of operation. Its operating temperature at the centre is about 200º cooler than the common 50 Watt Halogen lamp, even though this LED lamp is 25% brighter. Also, very little light energy shines into the ceiling space and this further reduces the attraction and buildup of insects. These features combine to create a lamp with a far lower fire generating potential than conventional incandescent lamps. A significant number of homes that have had LED upgrades have revealed the original Halogen Lamp installations were covered over with insulation. This causes globes to burn out fast and poses a huge fire risk to the building. When all of the benefits and risk factors are added up, (whether you buy from here or elsewhere) there's a strong case for the replacement of all Halogen Down-Light fittings as quickly as possible.